Giovanni Bertone first appears in the Painesville, Ohio, area in 1911. He migrated to Painesville from Conneaut, Ohio, in 1911, with his brothers Liberato and Sabatino. Giovanni Bertone, son of Nicola Bertone and Maria Giancola, was born on July 18, 1894, at Sant’Angelo in Grotte, Italy. He married Maria Narducci about 1925. Giovanni died on January 4, 1963, at home, 571 North State Street, Painesville, Lake County, Ohio, at age 68. His body was interred at Riverside Cemetery at Painesville, Lake County, Ohio. Giovanni Bertone, age 15, immigrated to the United States on June 11, 1910, travelling to Conneaut, Ashtabula County, Ohio, joining his brother, Liberato Bertone. John Bertone became a citizen of the United States on September 29, 1930. John resided at 563 North State Street, Painesville, Lake County, Ohio, when he was naturalized. Giovanni worked as a crain operator for the Diamond Alkali Company from 1917 until retiring in 1962. 1. Antoinette Bertone was born in 1925, at Ohio. She married William E. Stephenson. Antoinette died on September 22, 2011, at Lakeland, Florida. Her body was interred at Florida Veterans Cemetery at Bushnell, Florida. 2. Rose I. Bertone was born in 1927, at Ohio. She married James E. Conley. 3. Mary Carmel Bertone was born on December 23, 1927, at Painesville, Lake County, Ohio. She died on December 28, 1927, at 560 North State Street, Painesville, Lake County, Ohio, of hemophilia. Her body was interred at St. Mary Cemetery at Painesville Township, Lake County, Ohio. 4. Mary Jane Bertone was born in 1929, at Ohio. She married Robert V. Keener on July 22, 1950. 5. 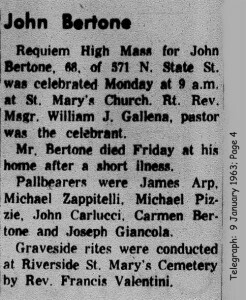 John Bertone was born about 1936, at Ohio. 6. 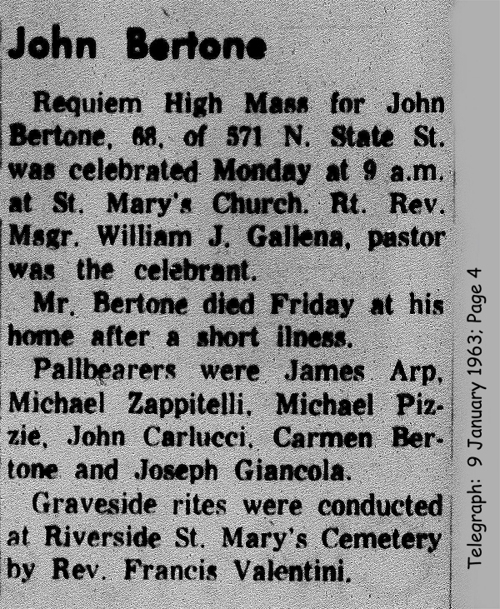 Joseph Bertone was born about 1939, at Ohio.